Pelican Feed | Pelican Feed addresses my need for renewal and rest so thathuman spirit may flourish in relationship with God. Most of us look for God’s presence as we go about living our lives. We join others in congregations at Church, Temple, Mosque and Shrines of all faiths, to collectively connect with the presence of God. We see God’s presence in the beauty of nature, in our families and in our work places. And yes, in hospitals! As hospital caregivers, we create a unique opportunity to experience God’s presence in ministering to patients. God’s presence radiates through our gifts and skills in each encounter with a patient and each other. Our patients offer us their trust and faith in our care. We do not have to look further than our existence and relationship to one another to experience the presence of God as human beings. The experience of human relationships whether as a care giver, a patient, or a co-worker is an experience in God’s presence. Praying each experience, you have throughout this work week brings you closer to each other and God. Who ought I be? Where is the Holy Spirit leading me? These questions have centered my theological development. Next week I begin my newest assignment from God. It is an exciting challenge as a resident in chaplaincy. I have told many others that God could have saved me from so much if he had led me here sooner. My Mother, upon hearing me say this, would have explained that I would not have been ready; that God chooses the time and place, and you either accept or not. Fr. Boudreaux, from Montserrat in Dallas, added to this by saying God never gives with only one hand. That he presents your options with both hands full and asks you to choose. This is the very essences of free will. The choices in free will abundantly bless me, even though I am a less than a perfect candidate for so many gifts. One of my awards given by my supervisor during my externship in chaplaincy guides my thoughts today, it is a plaque that says “I may not be totally perfect, but parts of me are excellent”. I am ready, but a little scared. I need to make sure that I walk with God. When I first decided to really look at my faith life, I was thirty something. I was a little lost and in need of a path to a love-filled life. I had just had my last child, who died four hours after birth. My husband and I began our grief in the same place, but grief has its own path for each of its recipients. He and I traveled different paths in finding our way. My friends and family were significant in my recovery from grief. My husband and I stopped sharing our feelings in hopes of not bringing the other to a dark place. We were kind and shared the bright moments, but we left each other after a time to a solitary existence in the dark. Upon the advice of a very good friend we continued to offer kindness and compassion when we saw the pain in each other. My best friend (other than my husband) had experienced a deep grief when her mother died. A cancer diagnosis occurred shortly after that death. When my son passed she was eight years cancer free. While she did not believe in God the same way as I do, she was the spiritual guide that I had not expected. She saw the human spirit differently than I did. It was one of the many things that bonded our friendship. We taught each other. When I found myself in the midst of anger at God, she was the one that shined light on my hypocrisy. I remember saying, “I am just going to give up on this whole God thing. I mean really, what has it gotten me? My baby is dead and I am heartbroken”. She looked at me said, “Are you really going to allow his death to separate you from God”? I was shocked; she went on. “You really want this baby to be what separates you from your faith? You are going to place blame on God and allow your child to carry that guilt into heaven? That is so selfish and unlike you”. Wow, I stammered out a “Well no, well I don’t know. You don’t even believe this stuff.” She then pointed out quietly, “But you do”. She opened my eyes to what I had missed. That I believe in a good and living God. That I believe in the communion of saints. That God too was hurting, that God’s plan is for us all to be born and live a fulfilled life. That sad things happen, but love, which is God, is the way out. That offering my pain to a healing disposition would reunite me in this communion. That giving up would hold me hostage to pain and suffering. We all feel pain when we lose control and an unthinkable outcome results. Blaming God did not offer any truth or escape from the pain of grieving. I was never in control of what was going to happen. I was only in control of my faith, my love, and what tools I chose to use in my healing process. Blame is an awful game that hides shame and pain. This lesson is one of the many that I have experienced in grief. God’s offer in this chaplain residency program allows me to use my insight. I can help others reframe their hope and love. I will not meet others that have the same concept of God or beliefs, but I will be able to hear their needs and desires. I pray I do not have to challenge them as my friend challenged me. I am ready to listen and hear what needs come through. I initially offer empathy followed by compassion that can help others recover, see light, and find the path that allows their spirit to move forward. My friend has passed on more than twenty years ago as cancer decided to revisit her body. I miss her every day, but I feel her presence and know that her wisdom is part of me. My prayer in this residency is to keep the bits and pieces of others as a treasured offering that prepares me to hear those in need with an open heart. I further ask for wisdom to develop my open heart so that my words and actions are compassionate. I smile with confidence that the Holy Spirit will be busy reminding me of who I am in God and who ought I be. Grief is a funny thing. It has a mind of its own. Even though I try never to run from it, because it will chase me down, I still run. I don’t want to feel this emotion today or any day. I want to put it off; it suffocates me and it is painful. I know I should face it straight on and deal with my emotions, my memories, and the gifts that have brought me to this time of grieving. My husband, children, and friends are checking on me, just I am checking on my sister-in-law, nieces and siblings. With the passing of my brother, we have lost a husband, a father, a brother, and a friend. This early morning, I woke for no apparent reason. A vision of my brother, a memory of him driving up to my parent’s home in a maroon convertible Triumph, flashed in my mind. The top was down and his long black hair was settling around his happy face as the wind had blown it freely on his drive. This was the first of many memories that flashed into my barely conscious brain. I have often written and said to others in grief: allow your memories to comfort you. That comfort is not without pain. My heart hurts, I will not see him again until I pass. I will not be able to use him again as my political moral barometer. I will not be able to hug him and tell him I love him. Of course, he knows these things, but they are no longer a physical reality for me. As other memories formed I organized them chronologically, and through the tears streaming down my checks, I am comforted. My earliest memories revolve around our family, when we were children. I remember seeing him head off to school in khaki pants and a white shirt. He usually had a novel in one hand and his tennis racquet in the other. I remember going with my mother to pick him up at the City Park tennis courts; it was a beautiful place. I remember what he looked like when he would leave in his dungarees as a Sea Scout. He and I recently discussed his explorations with the Sea Scouts, an activity that he loved. I remember his kindness and love for me when I failed, when I succeeded, and when I our mother was ill. I remember in the summers he would pile all the neighborhood kiddos into his car and drop us off at the country club to go swimming. He would include my sister and me in his plans, going to drive-in movies, po’boy shops and so many other places. I remember the love he shared with us, and particularly his special bond with my oldest sister. They were a great brother-sister team. He was twelve years older than me, so in many ways he always seemed like a grown-up to me. I remember sitting and listening to him tell our parents of his most recent adventure. He captivated my attention. I remember when he left to go to boarding school. I remember visiting him there, as well as his visits home. In his early college days, I remember the excitement of this new adventure. I remember the draft during the Vietnam war. I remember his struggles with what to do, how to precede, and his ultimate enlistment rather than draft. I remember eating Thanksgiving dinner at Fort Polk following his graduation from boot camp. I remember his growing pains as he turned into a fine and upstanding man. I remember his wedding and the joy that came with his love and relationship to his wife. I remember how he fell in love with each of his girls as they were born. He was a good brother, a good father and a good husband. He was not perfect, nor was I. We fought, we made up, and we loved one another. He taught me many things about myself and who I wanted to be. He was also my godfather. He helped me to know God as my sovereign, and later as my friend, offering unconditional love. I remember the assassination of Martin Luther King, Jr. On that day, when my mother and I came into the house, he rose from a rattan chair with blue and white upholstery and exclaimed to my mother, “Do you know what happened today”? She sadly answered, “yes”. I had no idea. I listened and took in the trauma of losing such a prominent civil rights leader. I was almost ten years old. It was probably when my sense of social justice began to develop. I don’t remember having an understanding before then. Today, as I watch the sun rise, it reminds me of my favorite Van Gogh painting, “Starry Night”. My brother is like the morning star. He brought light into my world, and that light will live on. In the Book of Revelations, we learn that we receive the gift of the morning star from Christ, who is light. This gift is given as an acknowledgement of our faith and victory over adversity (Rev 2:28). My brother was one who sought knowledge of, and relationship with, God. He shared his love and mercy. My memories offer comfort in my grief, but my grieving continues. God’s time is the healer and on this I will wait, remembering and loving my brother. Several days ago, I visited the Anne Frank House in Amsterdam. I did not anticipate the deep sadness that welled up inside of me. I am an emotional person, and I am usually able to reign in and bracket deep emotions when I prepare for them. I thought I had prepared. This day I unwillingly felt the tears roll down my cheeks; I was unable to control the enormity of my sadness. The secret annex was located above the factory owned by Otto Frank. As we approached a custom-built bookcase, the opening of the secret annex or hiding place, I experienced a feeling much like my visit to Auschwitz many years ago. It is hard to describe; it is a mix of fear and sorrow. The bookcase was beautifully crafted, the craftmanship of the piece is admirable. At Auschwitz, the beautiful flowers and gardens struck me in the same way, as we approached the opening gate. In each of these places I found myself experiencing the ordinary, and it is the ordinary that hides the horror of what became reality for others. In the house of Anne Frank, I was struck by the normalness of the living conditions. Although the living was anything but normal. Anne Frank describes in her diary the loneliness of her life. Being unable to go outside, to see friends, and just experience her life. The lack of fresh air would have devastated the human spirit in me. Air and sunlight are gifts meant for all of humanity. The experience of breathing in fresh air and feeling the warmth of the sun are necessary for the flourishment of the human person. The lack of these two simple but necessary human needs isolate the person and suffocate the spirit. This insufficient access would be enough to bring one to a deep place of sadness. I identified with Anne Frank’s description and incorporated them into my experience in the museum. It is clear to me that her parents and the others living in the secret annex were anxious, but that they had a strong bond and trust. She and her sister Margot decorated their room with photos from magazines, a very normal teenage thing to do. Jan and Miep Gies, members of the Dutch resistance, celebrated their first anniversary in the secret annex; the menu for this celebration is on display in their bedroom. Again, all these normal activities through natural design lighten the experience of hiding and fear. I believe that fear and sadness dominated the inner core of each person, and despite hiding, life went on. The fear they must have experienced of creating any sound in the daytime struck me at my core. They feared anyone in the factory hearing and reporting their presence. I cannot fathom the tension that must have intertwined their experience. And yet I can also understand the boredom that must have penetrated each person as the need for quiet left them little to do. The quiet anonymity tied their survival to boredom, tension and fear. At the end of the tour there are testimonies of others. Anne Frank’s father, Otto Frank, speaks about all that he did not know of his daughter’s thoughts and feelings. I cannot imagine the pain and sadness that he must have felt upon reading her diary. The unnecessary loss of his family must have been devastating. There are testimonies from others, famous and ordinary of her time and the present, on the importance of Anne Frank and her diary. For me, Anne Frank is a beacon that draws attention to the injustice of the Holocaust. My gut emotions remind me that she was a child bearing the weight of adult responsibility for self. This realization caused my tears to flow. No one should be robbed of life, of childhood, and of the ordinary. No one should live in fear of inhumane treatment. The anguish of fear and despair bought on by living without liberty is beyond what I know to be true for humans to flourish. The overwhelming sense of doom and injustice bear down on my chest and cause me to recognize Anne Frank not as an icon, but as a real person who reminds us of the perils of oppression and desolation created and perpetrated by others. What causes one to believe they have the right to prevent other humans from flourishing, and instead initiate abuse and annihilation? Is fear the main cause? I fear the loss of this lesson through the passage of time. It has been two-thirds of a century since the atrocities of the Jewish Holocaust, in the big scheme of time this is minimal. Moreover, there have been dozens other attempted genocides which have occurred since, such as in Rwanda and the Bosnian-Serbian war in Central Europe. Is this not part of what is happening in Syria and elsewhere today? I hear and see anti-Islamic, anti-Mexican, and anti-immigration rhetoric today, similar to the anti-Semitic rhetoric as in the days of Anne Frank. Have I allowed others to speak out against the Anne Franks of a new holocaust and not raised my voice against them? Will there be other Otto Franks discovering the diaries of their children after it is too late to save them? Is the fear of terrorism preventing us, as humanity, from recognizing oppression and the need for sanctuary for the oppressed? It is my belief that God is Love. That if we are to truly care for humanity in the ways of God, then we are to truly love. It should not matter how we worship, but how we live out vocation in caring for one another. That is God for me, that is love for me. I will forever speak out in whatever manner is necessary. If I am ostracized for my blunt speech, so be it. My vocation is to be a host for my Lord and thereby a host to all. Safety for the citizens of every country is a sovereign right, but part of that sovereignty requires the sanctuary for the marginalized, the poor, and the oppressed. I must hear their plight and come to their aid. Lady Liberty stands in the New York harbor as a reminder of our civic duty to one another. That is how I love. I am neither naïve or unaware that evil exist, but I truly believe that the defense to evil is love and mercy. I am overwhelmed by responsibility and overburdened by my own hand. 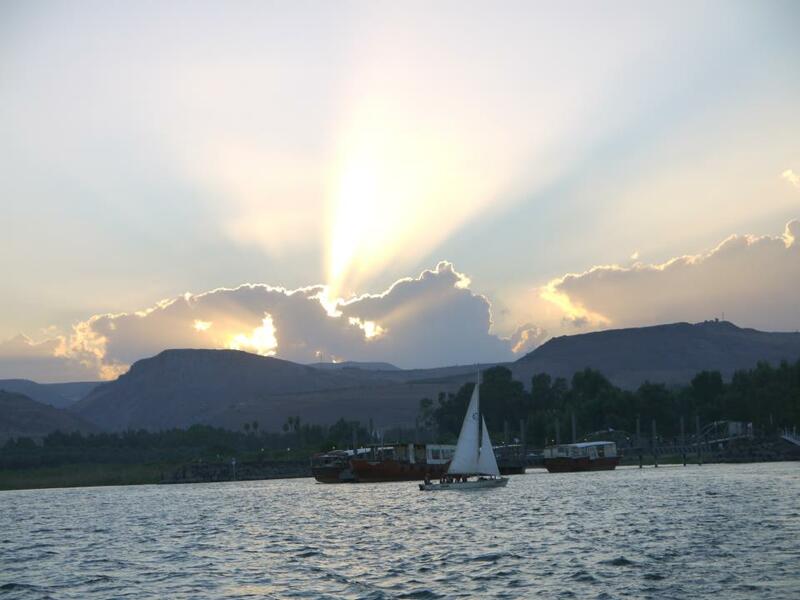 But, on the Sea of Galilee at sunset, there is a calm feeling that wraps me in the love of God. It is quiet and peaceful much like the peace I felt when I nursed my children. Comforting sounds surround me as I gently rock back and forth. The water laps up against the boat in a rhythm that is designed to ease. The smell of fresh and clean air fills my senses; joyfully, I take a deep breath. It cleanses my mind and opens my heart, for too often I forget to keep it open. Sunlight shines in beauty through the clouds streaming a warm array of colors in orange, pink, and yellow highlighting the blue sky. As the day slips into night, the warmth penetrates my whole being inviting me to join God and become one in this beauty. Jesus is cooking on the shore; waiting patiently for me to know that he is there. This is a place where I am with Christ, my Lord. I hear his voice and his hand feeds me. After a long week, I am scattered and often of no use to anyone. When I make the time to rest in him, I feel the promise of his love. With the relief of my daily stress, I refocus my thoughts, and the gifts that I have been given are renewed with vigor. I am ready once again to face my mission. I think of Christ, and desire to walk with him, but I must first place myself in his presence and rest in his mercy and love. I will always return refreshed and collected ready to meet the challenges of my life today. Grieving leaves me with more questions than answers. Is that grief I feel after another shooting of innocent people? It is stuck in the darkness of my mind, my throat, and my heart. How is this grief so intimate, yet so public? and the grief that resides inside. Mothers, Fathers, Sisters and Brothers are gone. Family, Friends, and Strangers carry the weight of the question. We live with the question of Why? Answers that cannot be known. Is my question a result of this grief? How can I share my grief? even if there are no answers? The light of others comforts me in the darkness of grief. My comfort grows in grieving with others. Neither their questions nor mine have been answered. With God’s help we heal each other. In my grief, I ask Why?